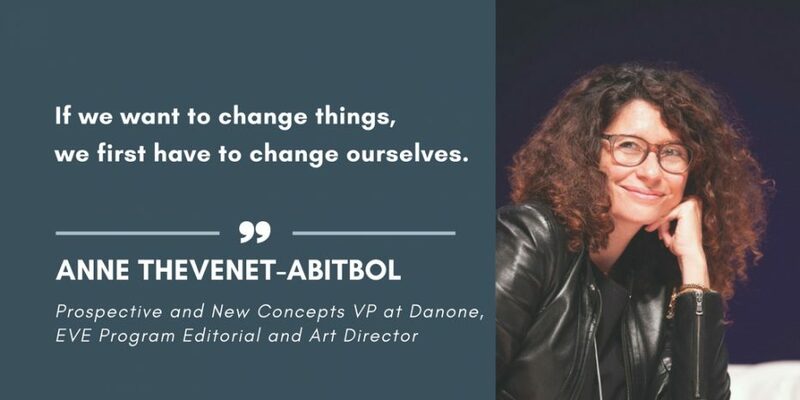 Anne Thevenet-Abitbol has been Prospective and New Concepts VP at Danone since 1998. She is responsible for the development of every new idea that has the potential to take the Group forward, whether in terms of marketing, HR, social or societal issues. 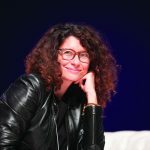 In particular, she was responsible for launching the brand of organic yogurts “Les 2 Vaches” in 2006, and she opened the “Aux 2 Vaches” restaurant in 2012. Starting in 2010, she has designed and led the EVE Program, an intercompany women leadership seminar, attended by around fifteen companies, as well as EVE Asia Pacific, and since 2012, the OCTAVE Program, which is focused on improving generational relationships within companies, and the impact of new technologies. In partnership with Utopies, Strategizer and NodA, she has also co-created the Noé Program on sustainable innovation. Studies show that the key factors to help women to get promotions within companies are training and the support of top executives. EVE ticks the two boxes. It all began with Franck Riboud, the President of Danone, who wanted to tackle the issue of women’s progression in the organizations. Why do we have 50 % men and 50 % women at the bottom of the management pyramid, and we lose women when climbing at the top? We realized then there was a co-responsibility in the existence of the glass ceiling between organizations and us, women. In other words if women’s progress is not as fast as men’s, it is partly because of the organizations that don’t make things easy, but also partly because of women themselves who often don’t dare asking for promotions and pay rises. This observation built the backbone of the EVE Program. We decided to create a training program on this very matter: to help women grow in self-confidence and to help organizations – usually men – to gain awareness of women’s difficulties so as to help them more efficiently. We invited other companies to join, as we are stronger together and also because the issue is relevant for all, whatever the company, whatever the country! And last, but not least, we put a 20% quota… for men. It is important for men to attend such an event to understand but also experience the issue, while being a minority, for a change. That’s how we came up with the EVE Program. The DNA of our Program stands on a strong conviction: if we want to change things, we first have to change ourselves. We have to work on ourselves, to better know who we are, what we want and how to express it. Be yourself and unleash your potential has been our motto from the beginning. It seems trendy and obvious today but when we started 7 years ago, it was quite innovative. Being centered, in harmony with yourself and comfortable in what you do is a winning formula for you and your company. It is a powerful driver which strengthens us individually and bolsters our commitment to collective performance. The EVE Program is bilingual and mixes self-improvement sessions through plenary sessions, interactive workshops and inspiring testimonies for 2,5 days. More than 3200 people (women and men) have attended EVE and are becoming more actively involved in their professional and personal lives. The next international edition will take place in Evian, France in October 2nd to 4th. The sixth Asia-Pacific edition will be in Singapore next July, 2019. And we are happy to announce our second edition of EVE Africa in Dakar, November 27th to 29th. The EVE Program is not only a yearly event; it is also a social network all year long, with its webmagazine, www.eveprogramme.com which is both a showcase and offers animated media. And of course, the traditional social networks such as Facebook, LinkedIn, and Twitter. When Mahatma Gandhi said “be the change you want to see in the world”, and Oscar Wilde wrote “be yourself; everyone else is taken”, the Programme EVE urges us to “be ourselves and unleash our potential”!